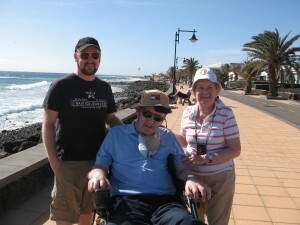 This section of the site contains personal stories from people who are living with Motor Neurones Disease. At the age of forty-three I was on top of the world. I was married with a wife and six children, I had my own business and the world was mine. As I busily planned our future, I was not to know that the hand of fate was about to intervene and change everything. 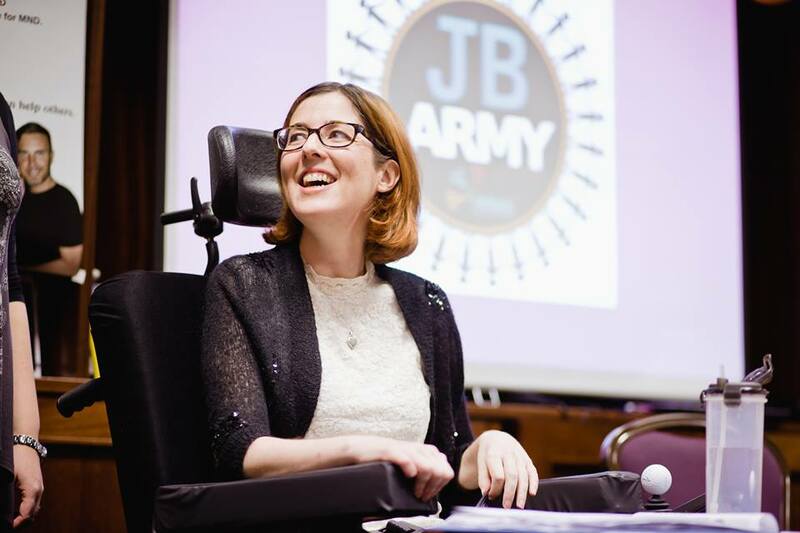 Our dreams came crashing down on us and all our hopes and aspirations lay shattered at our feet when I was diagnosed with motor neurone disease, a terminal illness of the central nervous system. The story I now share with you is one of picking up the pieces and putting the jigsaw back together. It is a story of digging deep to find the inner hero and summoning every ounce of courage and strength that a human being can find. During the early years of this disease I experienced the daily struggles of living with a disability: frustration, anger and feelings of helplessness. Then slowly, like the phoenix from the ashes, I shook off my mantle of despair. I came to accept my disability, I reclaimed my life and, gradually, I found my rainbow’s end. To my amazement, I once more tasted the joys of living. My greatest desire is that my story will bring inspiration to other disabled people to have the courage to deal with their situation. All royalties from the sale of this book will go to the Irish Motor Neurone Disease Association (IMNDA), which supports those who suffer from this devastating disease and also those who search for a cure for it. A cure may not be found in my lifetime but that does not worry me. If I’m not here to witness it, I will smile from the heavens above, knowing that I have made a small contribution to this achievement. As I approach my eightieth birthday, I look back on my own life. It has been a wonderful life, with all the emotions that any human being could expect to experience. I grew up in an era very different from today. I believe that no generation has seen as many changes as the people who were born in the 1920s, 1930s and 1940s. I know that we all live in periods of change but the changes that have taken place in Ireland over the past seventy years have taken everyone by surprise. I am fortunate to have witnessed this period. I write my story so that my children and grandchildren and future generations can know something about the Ireland of the past and the way of life of its great people. 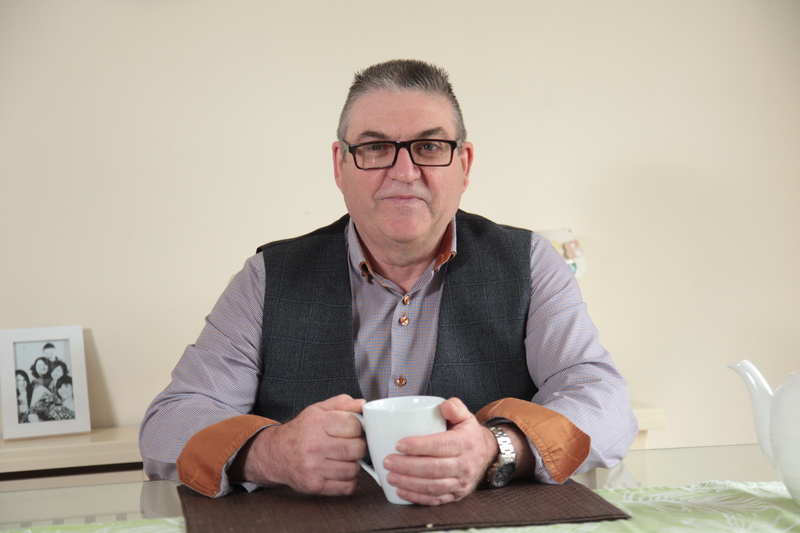 In 1977, I was diagnosed with motor neurone disease. Today, thirty-six years on, I am still alive, much to the amazement of my neurologists. As this is a progressive disease, I am now severely disabled and have lost almost all power in my hands and arms, but I am grateful for the abilities I still have. I wrote this book with the help of modern assistive technology, in the form of Dragon NaturallySpeaking voice-recognition software. The Irish Motor Neurone Disease Association lent me a computer and the software, which allows me to write by speaking into a microphone and on occasion using a foot mouse. The whole process demanded a lot of concentration but it was the only way for me to tell my story. A disability can ignite initiative in a person and become the stepping stone for them to pursue other projects. This is the reason I’m writing the story of my life, as well as wishing to pay tribute to the inspiring people I met along the way. Andy launched the book on 10th February in his local pub; McCaffreys Bar, Aughavas, Co Leitrim which also coincided with his 80th birthday celebrations and what a party it was! A great time was had with Andy’s daughters making the trip from Scotland and the States to share this very special occasion with their dad. A Dublin launch then followed on 26th February in the Light House Cinema, Smithfield with special guests including Jimmy Magee, Professor Orla Hardiman and one of the founding members of the IMNDA – Eithne Frost. Around 100 people attended to show their support, listen to some very moving speeches and of course purchase the book. The IMNDA would like to take this opportunity to thank Andy for the awareness he has raised in national and local media over the last few months, we are truly grateful for all the interviews and travelling you have done to promote this wonderful story. Thanks to the publisher Londubh Books and everyone who has purchased a copy or attended a launch. Against the Odds – Living with Motor Neurone Disease is available to purchase from the IMNDA for €14.99 including postage and packaging (an electronic/PDF version can be purchased and emailed at a cost of €10). Visit our online shop at www.imnda.ie, freefone 1800 403 403 or forward on a cheque/postal order/draft (IMNDA, Coleraine House, Coleraine Street, Dublin 7) to order yours. 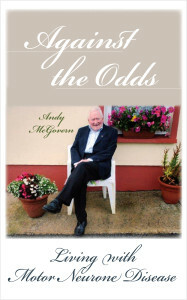 You can also avail of our 2 book bundle offer and purchase Against the Odds and Andy’s first book – They Laughed at this Man’s Funeral (normally €10) for just €20! 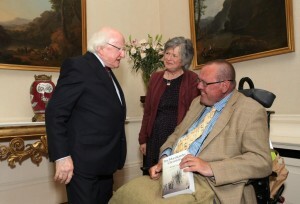 “The book is specially dedicated to those people whose lives have been touched by motor neurone disease: to the many dear friends I have lost along the way – a little piece of my heart went with you as you lost your brave battle against the disease; to the three hundred and twenty people in Ireland today who live with MND – we are bonded together by the hope for a future cure; to those who tomorrow will hear the shocking words, ‘You have motor neurone disease’– I would like you to take a little inspiration from my story. MND may ravage your body but it can never reach your soul, your fighting spirit, or the love that fills your heart.” Andy McGovern. I was wondering about how I was doing this time last year and both Jonnie and Mum reassured me I appear stronger and more content. There’s truth in their observations as I feel more able to cope and I recognize my limits with tiredness before they get out of hand and the whole house is affected. Yikes when that happens! Jonnie did a fabulous job of the turkey and ham thanks to some youtube advice from Gordon Ramsey early Christmas morning. Lucy did fabulous veggies,Tomas made heavenly sherry trifle and Mum laid a beautiful table. The kids were delighted with their seemingly endless amount of presents and the day flowed with the usual sense of hibernation that only this day brings. Being stuck in a wheelchair without use of hands or speech is such a challenge as a mother. A fellow sufferer who I’ve been in contact with described it as “raw grief “. Not being able to wrap a present or unwrap one for that matter, or share the joy spontaneously with the kids early Christmas morning is a bummer. However, without dwelling too much on what I can’t do, I am often spontaneously surprised by joy too. Kitty, for the second year running, came into my room with a present for me to open after she opened her first one. Her thoughtfulness is something I‘m so proud of, she’s such a wonderful little girl. We get to snuggle sometimes at night too if she sleeps downstairs. She puts her little hand in mine and I lift my leg to make way for hers. Then she serenades me with songs and one sided chat. How I wish my voice was alive for those extra special moments. I found myself in a church in Blackrock the other night at a removal. My neighbour‘s mum had suddenly passed away after a massive heart attack, it’s so sad and unfortunate for those left behind. The church had a lived in feeling, a lovely sense of life about it. I couldn’t hold back the tears when I saw the coffin and distraught family members following it down the aisle. My heart was breaking for poor Annemarie. I remembered my own Dad’s funeral fourteen years ago and how sad everybody felt at his too, sudden departure. The priest said something about guardian angels that touched me. I thought about Jonnie as my angel and how lucky I am to have him here especially now in my hour of need. No matter how unfortunate my life situation is right now, I find it hugely helpful to give thanks for all. Family, friends, neighbours, carers, home helps, Jonnie’s job which he loves and all that I am able to do. Every two weeks a lady called Ann comes to do energy work on me. Its’ official name is bio energy and it involves scanning the body’s subtle energies or aura and seeing where it’s blocked. She works with the chakras too, again seeing if they’re imbalanced and then putting them right. I believe this to be really helpful. When living in France in my twenties I also practiced this kind of energy work. I remember living in a rural part of the Pyrenees where no other Irish person had lived before it seemed. Apart from dedicating the best part of every day to painting and making intricate collages myself and a friend also did this kind of energy work on the locals. I remember one elderly ‘paysan’ Francois getting attacked by a swarm of bees, his hands all swollen and sore. I put my hands over them and wished them well. He seemed to get instant relief and the following day, I was his absolute hero as he said I had cured him! My prize was part of a wild mountain boar to cook and a gallon of red wine! When I think of that I only wish I could cure myself now! Saw the film ‘Gravity’ the other night. I really thought it beautifully shot and directed. When the female lead touches earth at the end I deeply felt her relief and love of being able to feel sand on her toes again. Oh how I long for that feeling! Recently, I‘ve been discovering lots of things. I hit a low patch when both big toes got infected and ingrown. When the doctor took one look she hurried to her bag to write a prescription for antibiotics. The thought of taking them was depressing as I knew how they wreak havoc on my system. Also, they have a habit of putting me off my food and the prospect of losing weight from my already thinning body was turning me right off. So I spent the weekend with toes immersed in salt baths, taking homeopathy for infections and imagining healing energy was running through my feet. When the chiropodist came on the Monday she was happy enough with them and I didn’t have to take the antibiotics, yay! What a great feeling of accomplishment I had! Then other changes started happening with my body which had me worrying after a year or more of practically no change. I noticed after sitting in my wheelchair for a few hours or more, my bum and shoulder blades were getting sore. This pain on my pressure points was a result of having no ‘padding’ on my bones, I was told, but nobody seemed able to advise me on this. It was only when we suggested an alternative cushion to sit on that they came up with the goods. Now I’m in bum heaven but the shoulder blades are not! Mum came up with a great idea of putting a layer of sheepskin between me and the chair and that’s really helped. But the physio noticed when I was doing my biweekly stand that the shoulder blades had actually moved inwards through lack of use. Well what d’ya know! Who would have thought these bastions to flight as I‘ve often thought of them, could be affected by the constant sitting. I felt my wings were well and truly clipped. Wayne Dyer says trust in your true nature. Kids too “know what to do” he tells us. If there’s one thing I’d like to pass on to mine, it would be to teach them to trust in their own nature; learning to listen to themselves in front of any decision big or small. So I’ve been trying to remember when they ask me for more screen time or another biscuit to say, “what do you think is the right thing to do”? and despite an obvious cheeky answer they usually know when enough is enough. When all that anxiety was rattling through my mind about the toes and shoulder blades plus the concern about losing weight, I got a bit overly consumed by it. It was only after a while when I was less ‘consumed’ that I realised I had actually missed myself! I like myself and feeling joy would have always been a huge part of who I am. Getting to like yourself isn’t easy but learning to trust in your decisions and listening to your inner nature helps. I thought about how long I’d been on that path recently when my cousin asked me about my thirties and what I’d discovered in those years. I told her that I’d learnt to trust in my gut instincts. 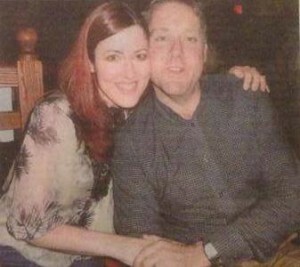 I knew when I met Jonnie in a popular bar in Cork on the eve of Valentines sixteen years ago, I’d discovered a gem! It felt right to be with him. So I went with that feeling. Another thing important to me for the kids is their music education. This is something I can actually do thanks to the wonders of modern technology; I can bring up rock and roll masters like the great Jimi Hendrix on my eye gaze, or the fantastic King of reggae Bob Marley. Pop seems to have taken over the music world these days so I need them to know what’s what and who’s who! It’s fabulous for me when they sit on my lap and listen to something together, divine time! Somebody wise I heard say recently said “do what excites you “. Music excites me, and I ‘m thrilled to be made aware of it again seeing as there’s so much I can’t actually do. Emma sadly passed away on the 27th of February 2015. Her amazing blog has recently been made into a radio documentary. To listen to this documentary you can hear the episodes by following this link. My operation to carry out the initial ‘fix’ of my Pelvis was carried out and it was at this time things began to happen. They had issues trying to get me to breathe on my own coming out of the anaesthetic. By all accounts, I believe I gave them all a ‘scare’. Further to this, a number of days later, some food went down the wrong way and I was taken immediately to ICU. I was to remain there for some time until I could be transferred to HDU. Only after the doctors from ENT were satisfied that I could swallow solids again, did they allow me back to the ward. Luckily for me, the first operation was carried out so well that in the end, I could do without the second operation, for the time being anyway. At that stage I was on Morphine, and I can tell you I was most definitely ‘out there’ in a world of my own. Not very nice I can tell you, for me or my visitors to whom I would bore with imaginary things,,,,,,, which I felt really truly happened. Anyway, back to my MND. Diagnosing Motor Neuron Disease is very time consuming as many tests need to be carried out to eliminate all other possible conditions. These tests include EMG, MRI scans, etc etc, visual examinations to check for fasciculation’s (twitching of muscles) and many many questions asked of both me and members of my family. When I was finally given the diagnosis, I was in shock. My life seemed to be turned upside down. The doctors were still carrying out some tests when I was asked to go to Prof Orla Hardiman in Beaumont Hospital for a second opinion on March 18. I told Prof that I was in somewhat denial of the whole diagnosis as I had been fine and healthy up to that day in early January, when I slipped on the ice. She thought, however, that the Doctors in Mater were correct in their suspicions of diagnosing MND. She asked if I could bring a member of my family to the next visit to her clinic on June 4. Needless to say, this was now confirming what I had dreaded. Over the next couple of months, my time was taken up by rehab on my pelvis and also those times spent mulling over what was in store for me… I often thought to myself ‘What is the point of the physio coming to me each day to try to get me back on my feet if this illness meant I would be sitting down for the rest of my days’ I suppose these thoughts are quite normal for somebody coming to terms with such a diagnosis. I DIDNT KNOW ENOUGH OF THE DISEASE. I only knew what I had heard from family and the little I had read in the papers. This is where people need to be aware that life is always worth living to the full, once you have it. I am lucky to have an amazing family and brilliant group of friends. At the moment, I am still living alone and am still driving which is amazing. I have no shortage of visitors to the house and have so many people I can go to and visit. I often think that it is sometimes harder for families of patient’s than for patients themselves. At times like these, life can put enormous strain on the family. I like to spend time with my nieces and nephews. They make me feel young again. During my lengthy hospital stay in early 2010, my sister Paula and her husband, Emmett found out that their toddler daughter, Kayla had Retts Syndrome. A couple of years previously, another member of my family was diagnosed with a serious illness. Thankfully, now, they are in somewhat good health. My family certainly has not had an easy few years but it is all of this that makes a family come together stronger. I feel now that it is so so important to spend as much time as you can with your family as you never know what is around the corner. Nothing I love to do than to spend time with my niece, Kayla and there are a lot of similarities with our two conditions. Opening doors with normal keys, windows etc. It is essential for one to have PMA whether they have MND or not. Things to assist PMA are laughing, smiling, achieving, seeing others happy, and being with my beloved nieces and nephews. Life itself can be seen as a terminal illness, we with MND at least know we have been given the opportunity to spend quality time with our loved ones. I have been attending LittleJohn Clinic in Walkinstown since 2008 and feel that their treatment of me with MND is amazing. They do not treat your symptoms but treat the body as a whole. My treatments there lead to both physical and mental wellbeing. Prior to being diagnosed, my career was in IT and so typing was never an issue for me. However, I now find I can only type using the two finger method. But after over three years of MND, that is not too bad. I also love using Facebook to communicate with family and friends. It’s a great way of sharing with a wide audience your updates. One of my favourite past times is doing the simplex crossword in the Irish Times, but don’t give me the Crosaire, I wouldn’t feel great leaving all those boxes blank…. Golf and Rugby would be my two favourite sports and most months of the year, there is some coverage on the TV of either sport. Compared to when I was a kid, there are so many good educating, comedy, sporting etc. channels. These help to fill those long hours. 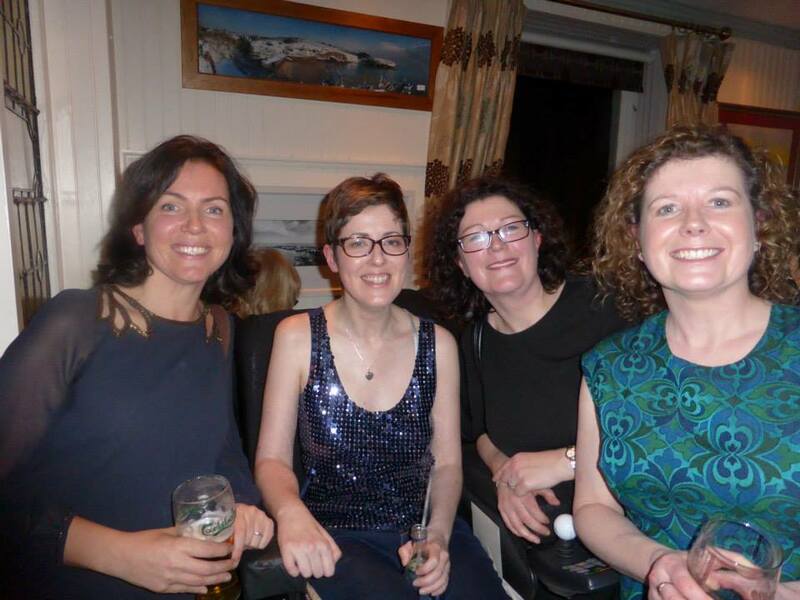 There are a number of fellow MND patients, some who have courageously fought against the disease but have unfortunately succumbed to it, and others who continue to battle on living with MND. 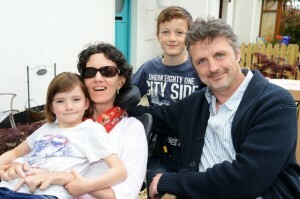 All of these people continue to provide me with inspiration in my ongoing battle with MND. 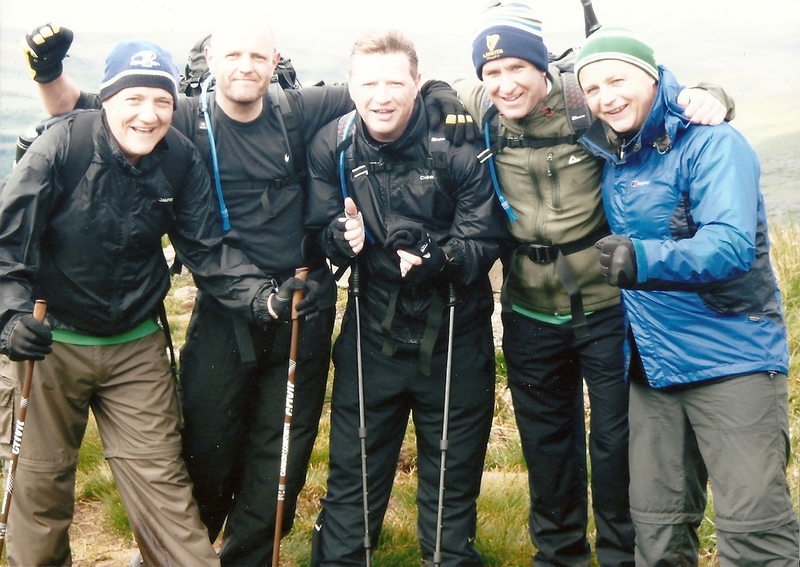 The IMNDA is an amazing organisation who rely on fundraising for 80% of their funds. They provide such tremendous support to all in the MND fraternity, both patients and their families alike. It is an organisation I had not heard of before my diagnosis as I did not know of anyone close to me who suffered from MND. 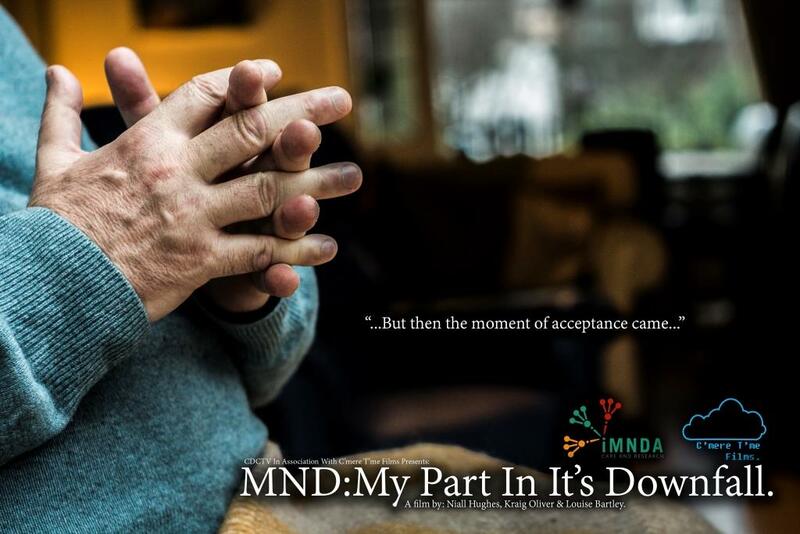 The IMNDA provide amazing support to those suffering from MND, both from a monetary aspect as well as sharing from their vast wealth of knowledge of MND. I really appreciate the work they do when I see what support is available to me compared to that available to my beloved niece, Kayla who suffers from Retts Syndrome. Unfortunately, Retts is probably similar to MND a number of years ago pre IMNDA where there was little or no support to those suffering from the condition. I hope that Retts finds its own “IMNDA” soon. Paul is 43 years old. Paul was born and reared in Ballyhale, Co. Kilkenny. When he was 8, his father sold his engineering business and bought a pub in the nearby village of Knocktopher. The pub was called Lannon’s but became known locally as Dickey’s, as Paul’s fathers name was Richard. 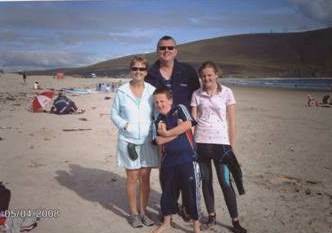 Paul loved playing hurling and played right through school and secondary school with his local club Ballyhale Shamrocks. Paul loved school but for reason’s other than study. A bright lad he drove his teachers demented. In secondary school there were 18 girls in his class and only 2 boys. Needless to say his head wasn’t in the books. 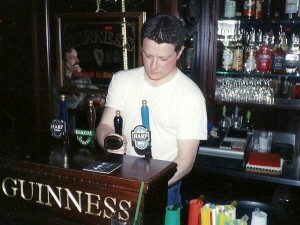 Ever since Paul was old enough he worked in the pub. He started out clearing tables and then he became a regular sight, pulling pints and lifting kegs. When Paul finished school he started working in the pub fulltime. At the age of 21, Paul left Ireland to chase his fortune in England. He managed a bar in Shepperton in Middlesex for 2 years. He then took a career turn and headed to Germany where he worked in construction. He returned to the UK to work as a fork lift driver. In 1995, Paul’s father passed away, Paul became homesick and longed to return to Ireland. Luckily the company he was working for were setting up a manufacturing plant in Drogheda at the time and Paul was charged with looking after part of the business. Paul worked his way up from the floor to the office and eventually management. After years of hard work Paul was made Vice President of Operations, in his new role Paul had to travel all over the world, visiting places as far as China, Russia, and South America. He often jokes that the only continent he hasn’t set foot on is Africa. Even with all his jet setting Paul still found time for love and in September 2001 he married the love of his life Sandra. Ever since he was young Paul had a fascination with motor sport. His Father and uncle had always raced Go Karts, the pair were well known in the Go Kart world with 15 Irish Titles between them. Paul followed their footsteps and ever since he was old enough was racing go karts, cars, motorcycles whatever he could. He owned his first motor cycle when he was 20 and the love affair continued until 2011. 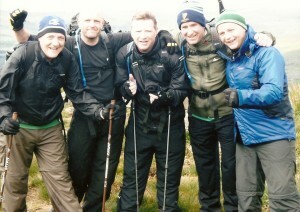 In 2010, shortly after Paul had completed the Four Peaks Challenge, he started to notice a problem with his right arm. When working on his bike, his right arm became increasingly tired and he found he was always dropping nuts and bolts. In 2011 Paul was diagnosed with MND. From once being able to lift two kegs at a time, Paul can no longer lift the kettle. Dressing himself is now impossible and he has recently started to have difficulties with his speech and eating. He can no longer work and he had to get rid of his motorbike. Jan is 42 years old. She grew up in sunny south in the picturesque Dunmore East. Her parents still run a Guesthouse in the lovely Waterford Town. She went to school locally and loved it. She was a very active student. She excelled in languages and was a proud member of her school’s debate team. She played basketball, the piano and even sang. 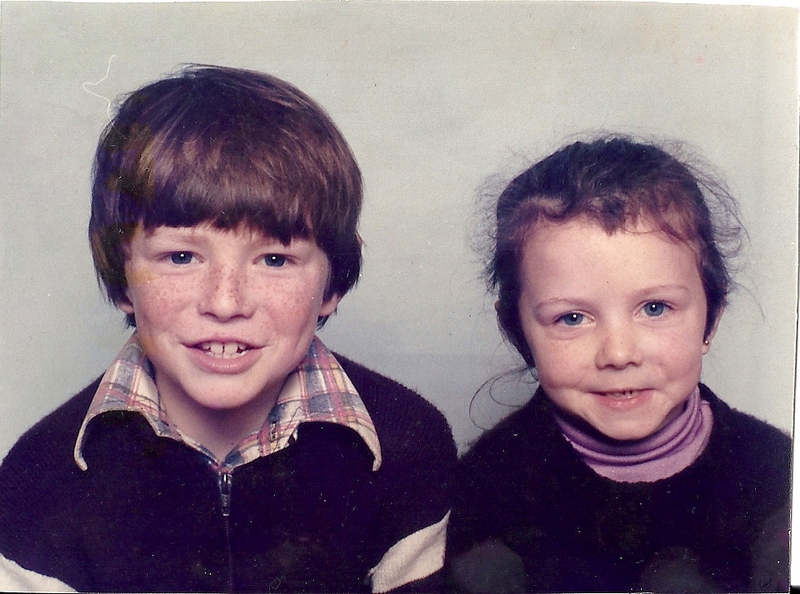 Throughout her early childhood and school life, Jan dreamt of becoming an astronomer and studied Science in UCD. However her love for languages never left and after completing 4 years in science she decided it was no longer for her. She then studied journalism in DIT Rathmines and from there began a very successful career in journalism. She worked for The Sunday Times for 15 years and now currently works for the RTE Guide. In 1997, she met her husband Terry at a friend’s wedding and life seemed to be complete. One of Jan’s other loves aside from her husband Terry, is her love for music. 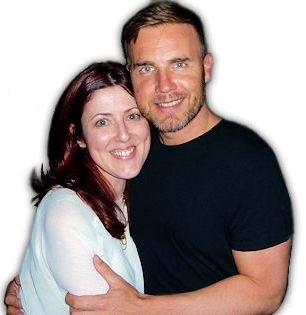 Jan is a self-professed Gary Barlow fanatic. She followed Take That from their early days and when Gary Barlow went solo, Jan religiously followed him. It was during his first solo tour that Jan began to realise that something was wrong. She tripped and fell at work spraining her ankle. However, after the fall she found the limp never really went away and she had to keep consciously lifting her right foot. She found she was struggling to keep up with her friends at Gary’s gigs as they followed the tour. At some of the shows her leg started to bounce uncontrollably. 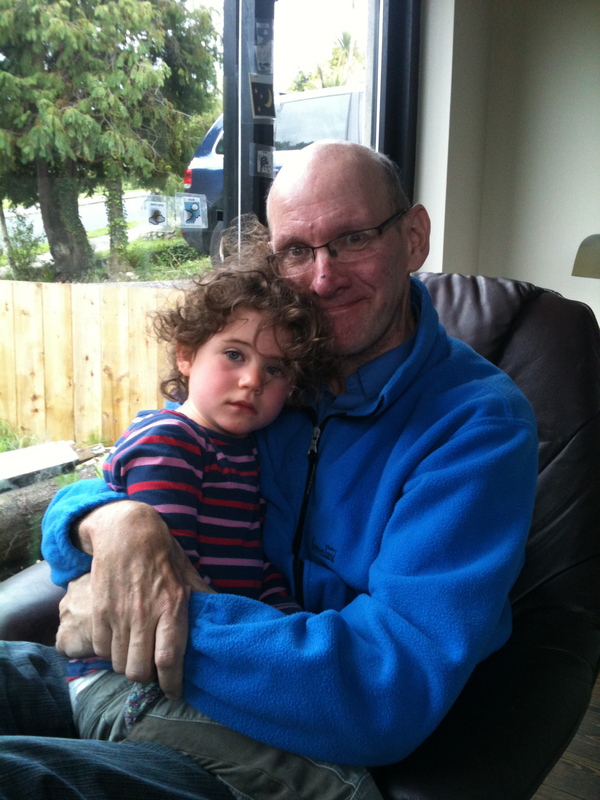 In March 2013, Jan was diagnosed with MND. Soon after diagnosis she was walking with a stick, then a rollator, now a wheelchair. Her arms became very weak. Her right shoulder sometimes dislocates as the muscles are no longer strong enough to hold her arm bone in place. “All you can do is try to cope with every challenge this illness throws at us and there are many. It is relentless. I couldn’t do it without Terry, he is my rock”, Jan Battles. We are the Kellys. My name is Shane and my parents are Christy and Mary. Six years ago this month our whole lives changed. My dad Christy retired on a Friday night and the following Monday morning was diagnosed with at first Bulber Palsy by a neurologist in the Hermitage clinic in Lucan. Talk about bad timing. That October was the worst month of our lives in many ways. I had just been informed that I was being let go from my job as a civil engineer, Dad’s brother John died suddenly and a very close family friend was killed in a car crash, throw in the largest banking crisis in history and a terminal illness diagnosis and you have our 2008 episode of reeling in the years cracked. 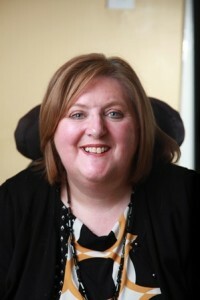 Of course it was not bulber palsy, after being referred to Dr Orla Hardiman later that month Dad was diagnosed with Motor Neurone Disease and our page in IMNDA Connect magazine was set in stone. My father Christy was a postman in our local area of Killoran, Galway for over 40 years. He married my mother, a Mayo woman 34 years ago and had one son, me. Dad is a typical country man, loving his GAA and farming. He was your old style post man. Letter boxes did not exist on his route only back doors and kitchen dressers. The entire parish relied on him for information and the odd bit of juicy gossip, the women fed him and the farmers got him to block the odd gap. It’s funny how things change. Six years after his diagnosis we are all still here and very strangely upbeat. Dad can no longer speak or write hence the reason we are writing a family story. There is just the three of us so when one member gets a blow like he did the shockwaves are hard and heavy. We all dealt with it in different ways, I tended to over exaggerate everything even getting to the stage where I began to get similar symptoms as my father. These symptoms were brought on by large amounts of stress and anxiety almost Psychosomatic and is perfectly normal as many offspring of people with terminal genetic* illnesses eventually discover. My mother tended to gloss over everything and pretend everything was okey dokey. It worked for her and balanced my reaction out. Most importantly my father, Christy, got on with living. He did as much as he could while he could without an ounce of complaining. In fact, he still does! Having a patient in the house can create an invisible dark cloud but when the patient acts like Dad has there is a lot more blue skies than gloom. Don’t get me wrong, we are not the Waltons and often the three of us curse and shout one another out of it. It’s healthy and clears the tension. The disease has been very hard on us and has taken a lot out of us. I returned from the States 4 years ago when Dad started falling. This was a huge surprise for me as I thought everything was running smoothly. From then on I went from job to job locally and even went back to college. During this time my Mother was stuck to the house while I was not there and this eventually took its toll on her. She eventually got carers burn out as the lack of help from the HSE was astounding. I then left employment to become Dads full time carer and help my mother free up some time for herself. This was a tricky manoeuvre as I wanted to be an independent 30 year old but still had to live under my parent’s roof and rules. At that time it was a very confusing stage of Dad’s illness. His medication was constantly changing; his communication and mobility equipment needs were changing and all at a rate that we and the HSE were not able to keep up with. This often left us dizzy and annoyed that the small things he needed in life to have a shred of independence were out of reach for that one week or month too long. This whole process has toughened us all. And there is a lesson in it for all families in our situation. We have learned to go with our gut feeling and that the professional is not always right. Example, Our Occupational Therapist insisted we stop using a sit-stand hoist over 2 years ago, this would have completely taken away my Father’s dignity or in his own words “be rolled around like a barrel” in a sling every time he needed the toilet. She is currently eating humble pie. We have learned not to be afraid to take risks. 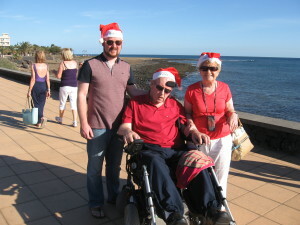 Example, while searching in vain for a Wheelchair accessible motorhome to holiday around Ireland I asked Dad “Would you get the ferry to France to pick up the camper?” He then replied by typing out on his card “Fly.” Believe it or not people that “Fly” comment escalated into a Christmas family holiday in Lanzarote for 7 days! All the facilities are there to be used and life does go on. We would never have dreamed of doing this only for dads fighting spirit and hunger for life. P.S Don’t forget to pack EVERYTHING! We have learned a busy mind is a happy mind. Example, from morning to night we have a schedule setup to help keep Dads mind engaged. At 7am, the TV in my parents’ bedroom is timed to switch on Ireland AM. Dad is awake and gets all the news before everybody else, his carers arrive and they discuss the goings on of the world that day. By 11am we load him into his van with optional docking system (a necessity) and bring him to our local day-care centre in Ballinasloe. The staff there are excellent and he often arrives home covered in lipstick. He’s home again at 4:30 and from here on Judge Judy takes over until it’s news time. If there is nothing on it’s time to hook up YouTUBE to the TV where the 2012 Leinster Hurling Final will be replayed or The Xmas Special of Ireland West Country Music Television, Mrs Brown also makes an appearance if we really need a boost. We have learned that “no!” does not mean “no!” if you badger and harp on enough. Example, we are now gladly receiving 26.5 hours of HSE home help a week, when the max they allow is 17. We have learned that respite does not suit every illness, especially for sufferers that have no voice. Example, Dad has tried every respite facility in County Galway and none with satisfactory results. For our next break we plan to have a mixture of family, friends and private home help to help keep Dad at home. We have learned that there is no place like home. A nursing home is 100% out of the question for a Motor Neurone sufferer in our opinion. Their needs both physically and mentally cannot be met by even the best nursing home in the country. Without the use of limbs and a voice being away from home becomes a form of torture. We have learned the hard way and Dad has paid the price as we found him to be only half the man he was after only 1 week of respite in nursing home/ hospital / hospice. So what I hope you can see from this little excerpt of our lives is that if we can do it anybody can. We are LIVING with Motor Neurone Disease not trying to escape and hide from it. We were dealt a bad blow and at last I have the confidence to say we are making the most out of it. We are now part of the IMNDA family. We know all the staff on first name basis, we trust and care for them as they do us. This battle is tough but we could not imagine going through it without the IMNDA. For anybody reading this that is feeling a bit lost or helpless, pick up the phone and call the IMNDA for help and they will either provide it for you or guide you in the right direction. Now back to booking Xmas holiday 2014! My name is Noel Noonan and this is my story of MND from a Carers Perspective. I would like to dedicate this article to my wife Denise, to Ciara and Brian our two children who ended up being the best carers ever. They looked after their mom 24/7, it was never an effort. They are now 17 and 14 years old and making great strides in their lives. To our families, old friends and neighbours who stepped up without ever being asked I will never forget what you all did. To all the professional carers who became family friends and still are two years later, you are all super people. To Mary the nurse from around the corner thanks for being a great help when we had no one else and Aileen whose father passed away very soon after Denise , you gave up so much of your time. Denise passed away on August 15th 2011. She was diagnosed in November 2007. Denise had the disease for 4 years. The first two years were ok, we as a family lived life to the max, the 3rd year was tough and the 4th year was difficult beyond belief. Denise throughout the four years and up until about two weeks before she passed away ran our home as she had always done, she was the boss. She had an unbelievable coping mechanism that gave her the ability to live with MND. Denise made caring for her possible in an impossible situation. She possessed a love of life coupled with a great spirit that helped her to get on with things no matter how impossible they seemed at the time. Lesson one: laughter. Throughout the final two years, no matter how difficult our situation was at home, we insisted on having an open house. All our visitors regardless of their reason to call knew that we never wanted them to feel sorry for us. We always had lots of company, between all the professionals and friends and family the house was always busy and full of laughter. Denise’s female work colleagues were filthy; their jokes could not be repeated. Denise just laughed at all of them. Denise knew every bit of scandal breaking in Limerick City before the stories broke. Being a full time carer for someone you love who is seriously ill is possibly the hardest thing anyone could take on in their life. To watch a partner or family member that you are caring for with MND and who is losing all their movement slowly but surely is very difficult. In hindsight for me the toughest part of all was the realisation that every night when everyone had gone home and Denise was asleep. I was on my own, it was then my brain started to go into overdrive with mostly negative thoughts. As a carer, to deal with this situation is very difficult. The trick here is to accept your situation. However this is not easy. I think the carer has to live with this. We had a great marriage. However our relationship changed on the day Denise was diagnosed. From that second everything changed for our family. In hindsight everything I did from that day was for Denise. 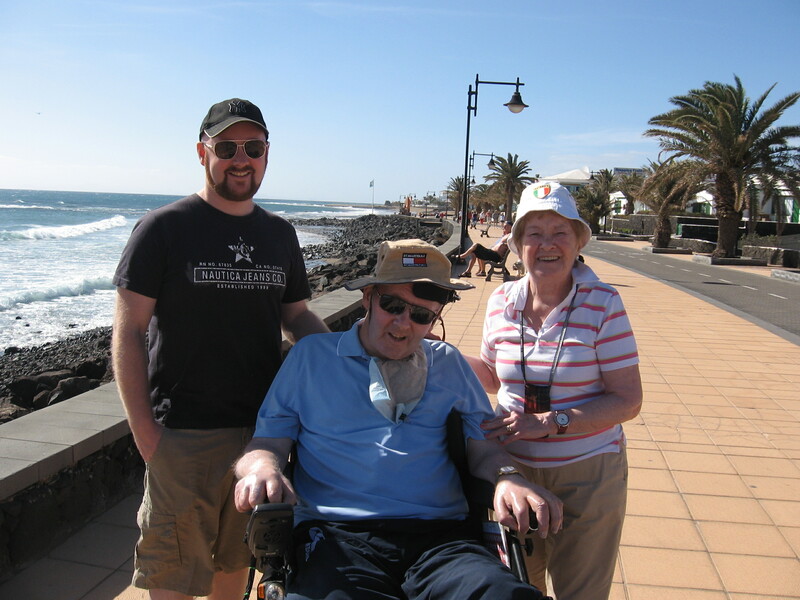 While she struggled in the early days to come to terms with MND, I had to step in and try to sort out the daily routine with the family. This marked the beginning of my time as a carer. Life moved along for two years. All was grand but then Denise became too sick to work, her speech was almost gone she was loosing power in her hands and legs. What I learned at that stage however was that every obstacle can be overcome no matter how enormous, providing both people agree that they are in this together and we did that. It was never discussed that was just how it was. Going to the loo, periods etc [I thought at that point I was going to give up and run away]. I learnt though from the Home Help staff that these little challenges were nothing. I was making mountains out of molehills. Denise and Alice [H.H.] used to have a great laugh at me. These issues proved to be trivial because we worked as a team to get through them. 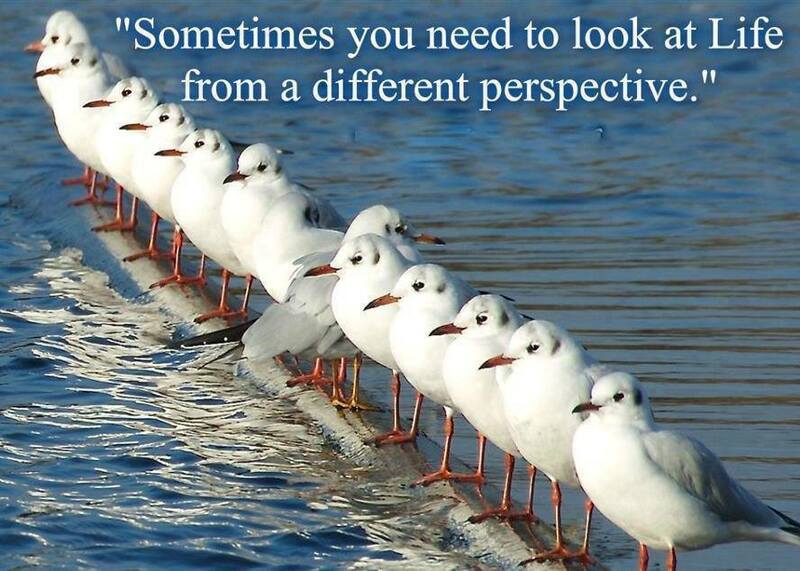 Another important lesson that I have learnt as an MND carer is as follows. Accept your mistakes and move on. My behaviour at times was not always what it should have been. The pressure was always on big time. The illness, the kids and my job all added to very high stress levels; right up to the end the stress levels were impossible. The most important thing I can say to other carers who may be in this very difficult position right now or who may be coming into the most difficult stage is that MND will never let up, it will never give you a break it keeps on getting tougher and tougher even impossible. However you are entitled to make mistakes, to get mad or even break a mug now and again. The situation entitles a person to, on occasion, let off steam. They were times that I wanted it all to end. I prayed for Denise to pass away, I hoped that this might end the constant pressure. Occasionally I used to get into a temper over little things, for example on one occasion I could not get Denise’s pillow just right and Denise could not tell me the right position. We were both upset. I got mad. As usual though Denise in the end won out. By looking in a different direction she let me know exactly what she thought of my behaviour. In the end her eye movement was all that she had left but by using only her eyes she would every time win all the debates and argument. However we made a pact. Denise would let me fly of the handle now again and when it was over she would give me a look that would say are you sorted now? I would say yes fine. She was amazing. This was a great trick between us; the air was cleared in an instant. Eventually I realised that I did my best and that sometimes my best did not measure up. I had regrets but that’s life and you can only do your best and I have now accepted this fact. Denise though as usual was ahead of the game and accepted all through her illness that I did what I could, she was never hard on me. One of the things we did as a couple and myself as a carer was to accept help very quickly from where ever it was offered. Everybody, family, friends, neighbours, Home Help, The Irish Wheelchair ASSC, IMNDA and Milford Hospice. Of course they all fell in love with Denise. I think they all thought I was mad, they were right. When Denise went in for Respite Care to Milford our local hospice, they could not keep me away. I used to visit about 4 times daily I never understood that the break was for me. The respite was Denise’s way of helping me out. She never liked going in to Respite Care but she did it for me. I should have realised this and taken more time off. By the time Denise came out of Respite Care I was still exhausted. There is a Lesson here for all carers. Once Denise went in to Respite Care for a long weekend to let Brian and myself go to an u12 rugby tournament. One of the proudest moments of my life was when he came back with the cup to show his mother. All carers should use the Respite Care when it comes up. Another lesson for MND carers is try and use the hoist at all times. I never did. I am a fairly big fellow and Denise was a petit woman [she will like me for saying that] and was losing weight. I could get Denise up using one arm and have her on or off the loo as quick as anyone. Against all advice I lifted Denise several times daily, this was never a problem while I was caring but several months after Denise passed away I decided to start walking again. I quickly discovered an issue with my lower back that required immediate surgery. The problem is now sorted but it was brought on by not using the hoist. Caring in our house was a two way thing. The kids and I looked after Denise but she looked after us every minute of every day. Realising what was ahead, Denise stronger than ever moved herself into the centre of our family. She knew she had to if we as a family were to cope with what was to come. Without her strength laughter and courage we would never have survived. Denise always had the final say in every decision made. This rule lasted right up to the very end. I often ended up with the short straw, on more than one occasion when I told Brian to put away the bloody X Box, I was told sorry dad, mom said I can play with it. That was that. I am writing this explaining my situation back then. I know that all is changing now with Government cutbacks. I hope as carers a stand can be taken against these cutbacks. I also know that if you are caring for someone with MND you cannot do anything else never mind take a stand against Government cutbacks. Despite what I have written, if I had to do it all again for Denise I would. Mistakes and all. I would never again complain. I still miss her. I miss the craic. She was my carer and I will never forget how she helped me to get through the toughest years in our marriage. It all started when I couldn’t move the fingers on my left hand. I let it go for a couple of months thinking it was a trapped nerve. I found I couldn’t lift heavy objects; things that I could usually lift became a problem, even a shopping bag. I kept dropping things. Going up stairs became very difficult for me. I thought that it was just because I was reaching middle-age. My fingers would freeze for only for a couple of seconds. My muscles would twitch. I went to the doctor she sent me for tests which were all clear so she then sent me to a neurologist in the Mater hospital. I was diagnosed with MND last March. Overtime my limbs got weaker. I now spend 99% of the time in a wheelchair and I don’t have much use of my hands. I can still type with a couple of fingers which is great because that means that I can still work. I work on the IT help desk in Arthur Cox. I told them when I was first diagnosed and they have been incredibly good to me. They pay for taxis to bring me to and from work; they paid to put a stair lift to my house. I have voice recognition on my PC which I’m sure the others in the office find distracting but they are too polite to say so. They’ve taken down walls and put in sliding doors into my office. If they were not so good to me I wouldn’t still be working. Every week they ask me if there is anything they can do for me. I never imagined that they could be so considerate and kind to me. And I will always be grateful to them for making my last few months working so pleasant. I think it’s important to work because it allows me get of the house for a few hours every day. Let’s me interact with people and it gives my parents a break. I feel I have deteriorated quite quickly but I know that this disease affects everybody differently so I don’t have anybody to compare myself to but I just know that in March last year, the week before I was diagnosed I was in London for a weekend. I walked around London, up and down the stairs of the tube but within a couple months walking long distances and climbing stairs were completely out of the question. Physically the thing I worry most about is my breathing I know 90% of MND patients die from breathing difficulties and my breathing has deteriorated quite quickly since last October. I am using a BiPap Machine at night. I find it a little bit difficult but I have to use it. Every time you face a new challenge you find a way to deal with it. Weather it is getting your Dad to hold the hairdryer and point it in your direction or asking your mother to put on your makeup. Sometimes I think it is unfair that as well as dying young you have to waste away slowly. I never had any pain which I always thought was a good thing because I always thought there can’t be anything seriously wrong with you if you have no pain. I used to say that to doctors until one doctor told me that they worry when you have weakness and sensation but no pain. Mentally I’m quite relaxed about my diagnosis, I always was. When I was waiting on my appointment I wondered if it could be something serious so I googled the symptoms and it kept coming back to MND. So you think maybe I have it but you don’t think that you do have it until it is confirmed. After the diagnosis was confirmed my family were devastated. We’ve always been a very close family that has talked a lot about everything so it helped to know I was not alone and I had the best support I could wish for. I believe that every family has some cross to bear and this is our cross. We are very lucky as a family, we’ve been very happy, we never wanted for anything. We’ve had some sad times but we’ve been able to get through them with the help of each other. People ask me how I am and I say I’m great because I do feel great. I am the same person I always was I just know that I will be dead in a couple of years. Everyone has to die of something and if I had a heart attack I would be gone already. Just because I can’t physically do things doesn’t mean I can’t do the things I enjoy doing. I don’t think I am reacting any differently from other people. No one knows how they will react. You can’t say “Actually I don’t want MND. I want to give back thanks, I kept the receipt”. So you have to get on with it and deal with the challenges it gives you. It’s like the old saying what doesn’t kill you makes you stronger and you are not going to be sent anything you can’t handle. People don’t know what to say to you when they hear about your diagnosis. I always say “it’s okay, I understand there is nothing you can say”. If there were words that anybody could say to help me they would’ve already been said. I don’t really think about dying. I think about my parents and how they will cope after I am gone. They are very fit and healthy which is great for me to because they have to do everything for me and I hope looking after me doesn’t wear them out too much. I think about my niece and nephew and how I hope they will remember me. I want them to miss me. If one day they have children I want them to tell those children about me. I know it’s really really easy to forget about people. Probably one of the worst things mentally is I think about things that are never going to happen. Things like I’m never going to retire to Florida, which is something, I had planned to do with my sisters. I’m never going to see my niece and nephew get married and have children. Even little things like I am never going to cook again, I’m never going to drive again which I’m told is probably not a bad thing for other road users, I’m never going to win Masterchef. It was never really going to happen but I could still dream. I’m never going to win the lottery but one doctor did say the odds of me getting MND were the same as winning the lottery. I think one day there is going be a cure for this disease. There are some really intelligent people working on a cure. There should be no limits to the amount of funding they are given to do their jobs properly. Nobody knows what causes the disease. I read somewhere that statistically athletes were more prone to get it. I was certainly never athletic but finding out why people get it would be a step in the right direction towards a cure. The IMNDA is really good about giving you tools, advice and equipment to help you cope with the disease. Electric wheelchairs, hoists, eye gaze for the computer and even an arm attached to the table so you can feed yourself rather than having somebody feed you, these all help to improve your quality of life and to keep you as independent as possible for as long as possible. We joke a lot about MND. I have a sister who we call Betty Davis, because I am convinced that one day she will served me up a rat for dinner like Bette Davis did in the movie “Whatever happened to baby Jane”. 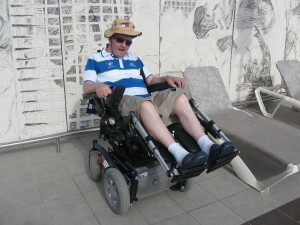 The same sister says she is convinced I don’t have MND; she says I’m just being lazy and I am pretending to make her push me around in a wheelchair. My niece once asked me if I had any regrets. I told her the only regret I had was spending so much money on anti-ageing cream. I don’t have a bucket list. All my life I’ve done everything I wanted to do. I have travelled all over the world. When you are terminally ill you don’t worry about things that you used to worry about. You don’t think about money, you don’t think about having a nice car. All I want to do is to spend quality time with family and friends. I am very grateful for the friends I have. They have made great efforts to spend time with me. 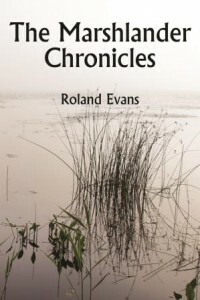 Roland Evans: I was born in Oxford in 1951 and my parents had a farm. They sold up in 1952 and moved to Ireland where land was cheaper and I spent a few years in North County Dublin. Farming proved difficult and we moved between Dublin, Kildare and Meath before Meath became our family home as we built on the banks of the Boyne near Navan. I was educated at Headfort preparatory School in Kells and Portora in Enniskillen. My parents ran a hotel in Navan and kept a herd of bullocks and the occasional racehorse. My adult life was in Teaching, I taught at 2nd level in the UK and primary level back in Ireland after marriage to my wife Annette in 1978. My final school was a country school in Co, Wicklow. I have two children a stepson and a daughter. I was diagnosed nearly 5 years ago with MND. At the time I was working, walking slowly but otherwise I was living a full life. Since then I have lost my mobility, my hands and arms have weakened and I cannot lie flat or sleep without a bi-pap breathing machine. I am dependent on my carers who get me in and out of bed, get me to the toilet and wash and dress me. I am fortunate to have my voice and the ability to swallow. I live a full life thanks to the IMNDA. Not only have they provided equipment promptly and ahead of time but they give expert timely advice and huge emotional and financial support. So that others may have the same support and so that vital research can continue, I am giving the full proceeds of the sale of my book ‘The Marshlander Chronicles’ to the IMNDA. I grew up on the banks of the Boyne and in winter it over spilled its banks. It was rich in wildlife and after the waters retreated in spring the rushes and reeds were rich for childhood exploration. In 1969 the river was dredged and deepened and all this disappeared. The memory lingered and I began to imagine the marshes many thousands of times bigger and the book set on another planet was born. ‘Water is our life. Without water we are slaves.’ The words of Solomon Drake rang in the ears of 14 year old Prins, citizen of Marshland, a wetland rich in animal and plant life. Prins is despised by his peers because of his physical weakness. The story opens with the arrival of CORE (the council for renewal and enlightenment) who want to persuade Marshlanders to sell their wooden houses on stilts so the marsh can be drained in return for gold. One of his tormentors, a representative of CORE, drops paper from his pocket. Prins has a secret. He can read, one of the few in his world who can. For most Irish men and Irish women the year 2016 was a year of remembrance, commemoration and celebration. For me it was just that, but it was also a year of profound sorrow. Oh it started off okay-ish. I had gotten indications from a doctor in the latter part of the previous year that following a battery of tests that I may have a rare form of MND but nothing definite. “We’re still doing tests. It’s a process of elimination.” The only things we had eliminated were Parkinson’s and MS. But who knows, it may be something else. I am an optimist, I think, or maybe I’m just in Egypt (in De Nile). I just knew I was not right. My speech was beginning to change (slur) so I had to slow down to make myself understood. People told me it was fine but I felt it was a lot worse. I also found my balance, coordination and strength (power) was diminishing. But I had to keep up the facade; I didn’t look ill so it was that bit easier to pull it off. You get terribly inventive when you want to hide that which is not obvious to others. My mother turned 86 years in December 2015. She was in a nursing home, a diabetic with advanced dementia. Thankfully she still recognised me as one of hers, albeit at times her son, her brother or even her husband. She knew I was hers. I did not want her to know that there was anything the matter with me. She could do nothing for me other than worry. I felt she didn’t need the worry so why tell her. Please forgive me Mam, I hope you understand. 2016 turned real sour for me and my family on Sunday 1st May when Mam passed away suddenly but peacefully on the 45th anniversary of my father’s death. He was 50 years old when he died. 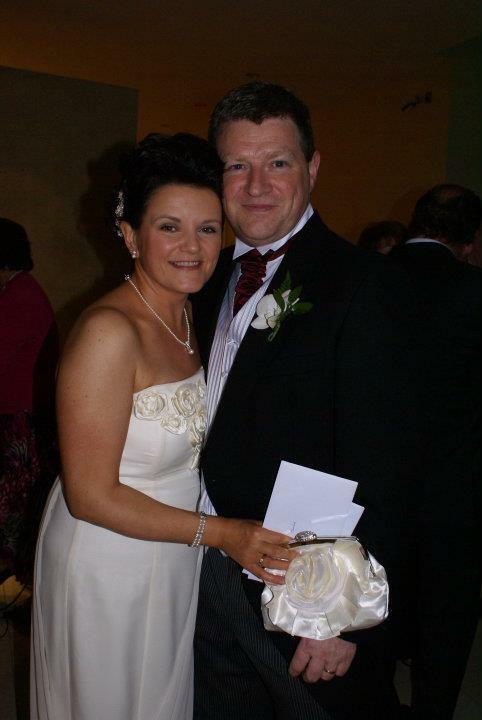 Two months later, on the 27th June the man above came calling again and this time he took my beautiful wife. It is said that the good Lord will not burden you with more than you can carry. He must have a strange sense of my strength, because he is surely testing my resolve. From May to July we had 5 funerals of close family members. I made contact with IMNDA in mid May through my SALT. Within one week I was interrogated (joke) interviewed by Fidelma in my own home. I couldn’t believe the speed of action. Fidelma had assured me not to worry when I told her that I did not have a definitive diagnosis yet. She said that will be all sorted when you meet the Professor. Life then took over as happens. They say “Man makes plans and God smiles”. Monique (my wife) and I had planned to go to Brighton for Dawn’s (our daughter) graduation. She had completed her Physiotherapy Masters in February and the graduation was on in July. We had said we would go so I could not disappoint her. She was home 2 weeks later for Monique’s months mind Mass. All the family were gathered in the kitchen that Friday night when Sophie (our married daughter) and Patrick (her husband) said they had a bit of good news. Sophie said that Patrick had entered one of his hanging flower baskets in a competition and had only just won 1st prize. She then asked if we wanted to see photos and handed 2 or 3 to her sisters and brother. Within about 5 seconds there were screams, tears and hugs. The photos were scans of the baby that is due in mid February. And that I believe is the circle of life. I did meet with the Professor and her team. You know when you get “bad news” health wise. One of the first questions asked is “HOW LONG?” You may get the “well it’s hard to say, things are complicated, it depends on blah de blah de blah”. Basically – how long is a piece of STRING? The Professor explained to me what my variant of MND was and what to expect. Then she said to me that I would not die from MND. I felt like she handed me a ball of twine and not a piece of STRING. Susan, my sister, expressed my situation very well when she said “If Carlsberg did MND, then my version (PLS) would be their version”. I am living with MND. I’ve had, what some would say, a hard year. But I get up out of bed every day, I leave the house, I meet people. If I went into myself and stayed indoors, I may as well be in the grave beside Monique. I will be there someday but not before time. I meet people and they tell me I’m doing great and I’m looking great. I tell them I think my glass is half full. I say this but there are times when I find it hard to believe. I suspect at times that some bugger keeps changing the glass for a smaller one though. I’m nothing special. I’m extremely fortunate to have a very loving family. I suppose I could claim a tiny bit of credit for that. I find in life you get out what you put in, or at least some. I believe in the spirit of volunteering and giving of one’s time, knowledge, experience or whatever freely. Because believe me that – Well done, Good job, You’re great, You’re the best or even a simple Thank you is well worth all the effort. The best volunteers are not paid money. Not because they are worthless but because they are priceless. I am a volunteer in many different areas of life. 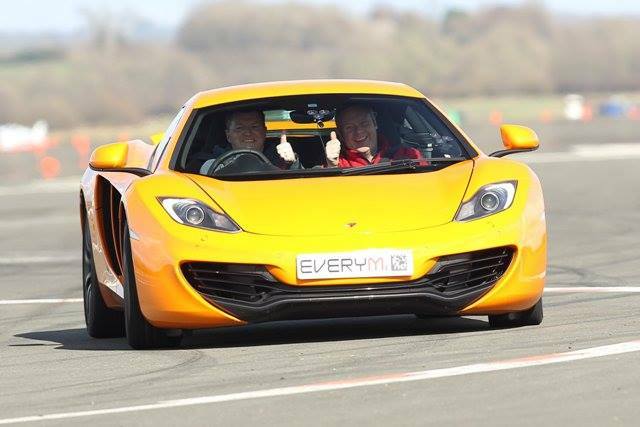 41 years Army reserve, 39 years Rugby clubs, 20 + years Rugby Referees etc… I never wanted to be a passenger in any group I was involved with. I always wanted to be a driver. This enabled me to push myself to the limit, get the best out of myself in every situation and most of all enjoy life to the fullest in everything I did in my life. I am now not just a member of IMNDA, but also a volunteer for the association and will do whatever I can for as long as I can. I intend banking some brownie points before I will need help. That’s just the way I’m built. Like I said, I’m nothing special. Just doing what I can while I can.